In AX 2012 you had the ability to use Active Directory groups to help manage security within the application. Here is a great overview of the setup of this functionality. But what if you wanted to do the same process within D365FO with Azure AD groups? Well we immediately run into an issue because out of the box this functionality is disabled, so how do we go about turning it on and getting it set up again? Step one is we have to put our environment into ‘maintenance mode’. The reason we have to do this is because we have to change a setting on the License Configuration page (found at System Administration -> Setup -> License Configuration) to enabled Active Directory Group Security and to do that we have to put our environment into maintenance mode. If you don’t do this, you will get this nice warning when you go to the page and you will not be able to actually edit any of the configuration values. Currently the only way to do this is via command prompt, but it appears that in the future there will be a way to do this via LCS. Instructions for this process can be found here. Once you enable maintenance mode and enable the Active Directory Security Group configuration value, make sure to disable maintenance mode and restart your AOS. Now when you go to System Administration -> Users will have a new entry called Groups. This page will look very similar to the Users setup screen, but you are setting up group security instead. The first thing to do is to import the Azure AD group you are looking to set up. Once you select the group, you will notice the screen looks exactly like the User Info setup screen where you have a details area at the top and the roles you want to assign at the bottom. Once this is setup the final step is to create each user of that group as a user within D365FO, but only assign them the System User role. Now going forward any user assigned to this group will automatically inherit the security the group has. In this way if you need to make a security change that will affect all users of a group you can make the change at the group level instead of going to each user one by one. Disabling an Azure AD Group does not disable users assigned to that group from logging in, only disabling the Azure AD user, removing the group as a user from within D365FO, or removing the D365FO user entirely will affect the user’s ability to sign into D365FO. There have been times where users think if they disable a group that all of the users assigned to that group will automatically lose access to AX/D365FO. This is not the case, the logic to determine group access only looks to see if the users are a part of that group not if the group itself is enabled. An entire forum post about this topic can be found here. All assigned access is cumulative, so if a user is assigned roles directly and is set up in an Azure AD group that is also assigned roles that user’s access will be a summation of both the directly assigned roles and the inherited roles from the Azure AD group. While this process can help with setting up user security, it can also make it more difficult to report on what access a user actually has. 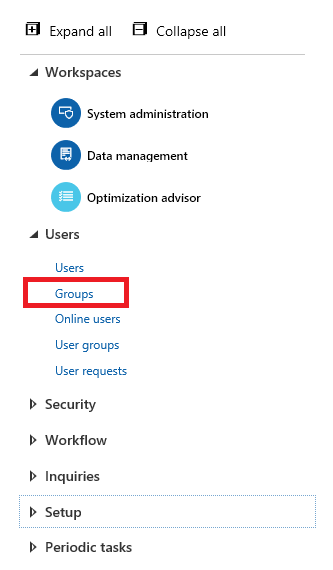 Because you have to make two separate reports, D365FO User -> Azure AD group assignment and Azure AD group access within D365FO (and remember the group is setup as if it were a D365FO user). Which if you’ve read previous posts of mine you know how difficult it is to determine user access within D365FO with the out of box reports available. Note: A report like this one in Fastpath would help with this process, also all of Fastpath’s reports (including User and Role Access) fully support both AD group security as well as Azure AD group security setups in AX and D365FO. I hope this post helped explain what the Azure AD group security functionality is, the benefits it can provide, things to look out for. If you have any questions about this please feel free to reach out. Nice post Alex. We had already implemented this but we face an issue pertaining to WF. Since sec role is controlled thru grp the wf configured to those groups are failing. Any solution for this? 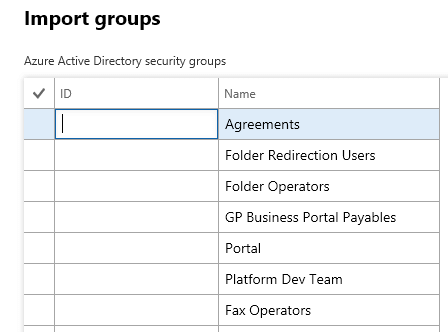 I believe workflows using security roles will not work when using Azure AD group security because users are not assigned roles directly as they get their security assignment through AD Groups. This page states that one of the prerequisites of using workflow is that you assign roles to users. Nice article and very useful, we had implemented in one of our project, but find issues in Workflows, when we assign Groups with security roles. Since Groups can not be associate to worker/person.Are we missing any configurations or setup for workflow?